I got an invite from Cherry Mobile for an upcoming launch of new phones and tablets. 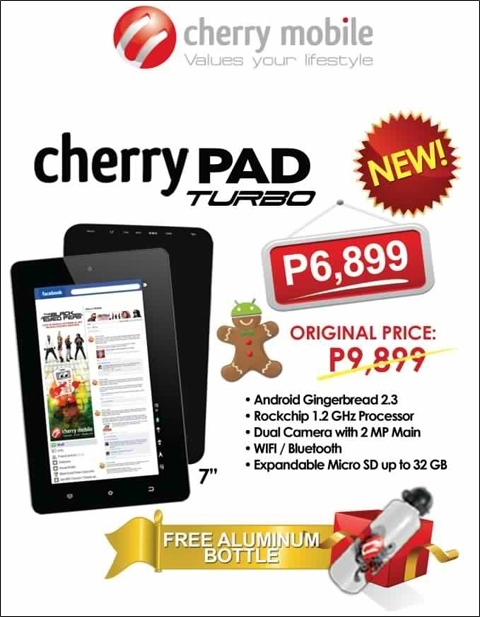 The invite is silent as to the products to be unveiled but it seems that one of them is the Cherry Pad Turbo, a 7-inch Android tablet that runs Gingerbread and powered by a 1.2 GHz processor. The tablet is originally priced at P9,899 but will be offered at P6,899 as a special introductory price. I will update this post as soon as the details above are confirmed. UPDATE: Cherry Mobile has confirmed the product as well as the pricing. sana me available din kyo ng lcd ng cherry pad turbo pra mpplitan nmin ung smin at d lng pra smin just in case n me mcraan p ding iba e madali n cla mkkpagpapalit s mga service center nyo…. where can i buy this? does this include acrobat, word, excel? hi! does this tablet includes a word processor or something like that where i can type in docs? also, does the turbo has 3g modem? thanks a heap! Battery life, and panu ang networking? sim capable? Nice post.But wat’s the battery life..